Martin McQuillan is professor of literary theory and cultural analysis, Dean of Arts and Social Sciences and Pro-Vice Chancellor of Research at Kingston University, London, where he is also Co-Director of The London Graduate School. He is a writer, filmmaker, and commentator on HE policy. He was previously Pro-Dean of Research (2005-09) for the Faculty of Performance, Visual Arts and Communications at the University of Leeds, where he was also Head of the School of Fine Art, History of Art and Cultural Studies (2001–2005). Before that he was a Lecturer in English at Staffordshire University (1997–2000). He works in the spaces between literary theory, art theory, cultural studies and continental philosophy, and writes on the work of Jacques Derrida, Hélène Cixous and Paul de Man. He was the editor of The Year's Work in Critical and Cultural Theory for Oxford University Press (2003-05), the journal Parallax for Routledge (2000-10), and has edited volumes of the Oxford Literary Review and Derrida Today. 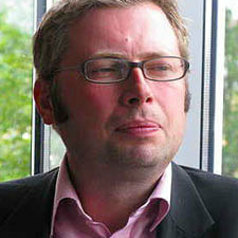 He is the editor of The Frontiers of Theory series for Edinburgh University Press.